Born in Grovesport, Ohio where his father raised horses, by the age of 12 Rarey could tame virtually any wild horse. He was considered one of the greatest horse trainers in American history, and in 1856 he published this little book. About J S Rarey (Author) : J S Rarey is a published author. 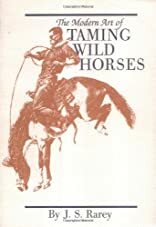 A published credit of J S Rarey is The Modern Art of Taming Wild Horses.